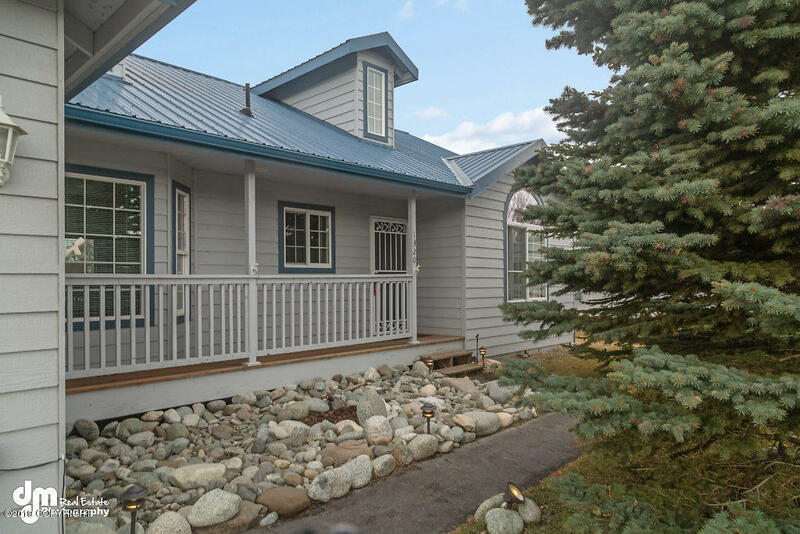 Beautiful ranch home located in a quiet cul-de-sac in Cedar Hills, just minutes to Palmer and great commuter location to Anch! Very well cared for home with MANY updates and will include a Home Warranty! Great mountain views to enjoy from the front porch! Stunning landscape lighting that highlights the beautiful spruce trees and front walkway! Mostly new SS appliances.......... ...new carpet w/ upgraded padding, new engineered hardwood flooring in main living area, new travertine stone flooring (with upgraded membrane) in kitchen and entryways and new back-splash tile in kitchen. New light fixtures including ceiling fans, new nickel finish door hardware. Fresh paint and trim throughout most of the home. Dormer windows that bring in a lot of natural light! This ranch home is a split floor plan, two bedrooms separated from master suite by living room, dining room and kitchen areas. One of the bedrooms has a bathroom connected and has a deep closet and alcove area with a half wall separation. Front bedroom must pass through short hallway to a bathroom. Spacious living room features a gas fireplace and vaulted ceiling. Upgraded metal roof, security screen doors front and rear. On-demand water heater installed in 2016. Home features energy saving Ecobee4 smart thermostat system that can sync to your phone and integrates with several smart-home formats. Backyard features a porch area and a fenced area, great for a dog kennel/run. Various mature spruce trees were professionally planted, making for a beautiful landscape! Additional note: MEA to repair driveway and landscaping (hydro-seed) approx by June 1st. Please contact MEA for more details.